Posted on Sun, Feb 12, 2012 : 12:13 p.m. The Ann Arbor Bridges Replacement Project’s third public meeting will be held from 7-8:30 p.m. Thursday at the Shelter Annex at Burns Park, 1200 Baldwin Ave. in Ann Arbor. 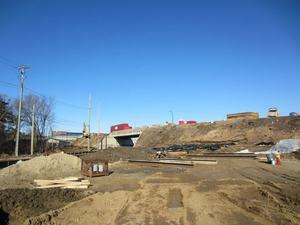 Work on the $22.8 million reconstruction of the East Stadium Boulevard bridges in Ann Arbor began Nov. 28. Stadium Boulevard will be closed to vehicular and pedestrian traffic through most of 2012. This is a view of the East Stadium Boulevard Bridge over the Ann Arbor Railroad tracks, taken from the University of Michigan Red lot looking north on Tuesday. The meeting will address updates regarding construction progress and scheduling, and a brief question-and-answer session will follow, according to a news release. Light refreshments will be provided. The next public meeting will be held on Thursday, March 15 at the same location. For more information on the Ann Arbor Bridges construction project and detours, visit http://www.annarborbridges.org. Sun, Feb 12, 2012 : 5:36 p.m.